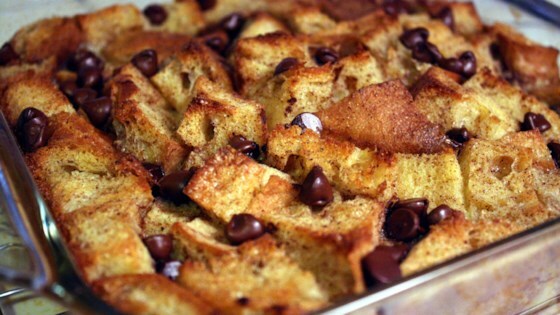 "My family LOVES bread pudding, and this recipe is one that I have fine tuned to their taste. I have to double this recipe, and bake it in a 9x13 inch pan for my family! It's great for breakfast or dessert and is delicious with milk poured on top! Enjoy!" Break bread into small pieces into an 8 inch square baking pan. Drizzle melted butter or margarine over bread. If desired, sprinkle with raisins. In a medium mixing bowl, combine eggs, milk, sugar, cinnamon, and vanilla. Beat until well mixed. Pour over bread, and lightly push down with a fork until bread is covered and soaking up the egg mixture. Make this 5-star bread pudding for dessert or breakfast. My family and I love this recipe. Even my wife who never used to like breadpudding loved it. My little trick was instead of raisins I thinly sliced a granny smith apple and used it in it's place.